Robert Beck's 2018 Exhibition, Archetype, was presented at the New Hope Arts Center, in conjunction with him being named the New Hope Arts Legacy Artist. His guest artist was Ceramicist and sculptor Katherine Hackl. The exhibit ran for a month and was visited by more than 650 people. See Katherine Hackl's website HERE. Robert Beck, Schnitzel oil on panel 24x30"
"His art is the language by which he reveals small truths in a noisy world." Those are the words Carol Cruickshanks, Executive Director of New Hope Arts, uses to describe the works in Robert Beck's exhibition "Archetypes" currently on display there. Go there and you will see she is absolutely right. There are 51 paintings on the wall and each one quietly speaks the essential truth of the scene that is depicted. In "Seining" fishermen are gathering shad near Lambertville's Lewis Island. The net is spread, the fishermen are barely seen in the falling darkness as they dip their oars in the rippling, shining water not far from the bridge. "It's a moment in shad fishing," Beck says. "Cars are going over the bridge, people are walking in Lambertville, but you don't see them. You don't hear them. You see the fishermen doing it the old way, drawing the fish in the net. It's not just what you see, it's the experience. I try to do an image that resonates on an archetypical level." Many of the paintings on exhibit were done in an old fishing village in Maine where Beck goes annually to paint. "Shipyard" is the view he says he sees across a wet grassy area to some buildings and boats while he sips his morning coffee. And in "Morning Wharf" we come up behind two fishermen walking to their boat in the low light of early morning. "Willis's Shop" portrays the white-haired ship builder at work in a shop filled with all the bits and pieces of his trade. The show transitions to a totally different lifestyle--Beck's studio in Manhattan. There we see "West Toward the Hudson," the view from his rooftop. And street scenes such as "Steam Vent" where yellow cabs with lights on are about to drive under a shaft of vented steam. And displayed nearby is the archetypical "Hot Dog Cart." If that transition from Maine to Manhattan isn't enough for you, there are rural scenes such as "Stalk Cutting" where Amish farmers are leading two four-horse teams cutting the stalks the old way. And there's "Schnitzel," described by Beck as an "old world pig." 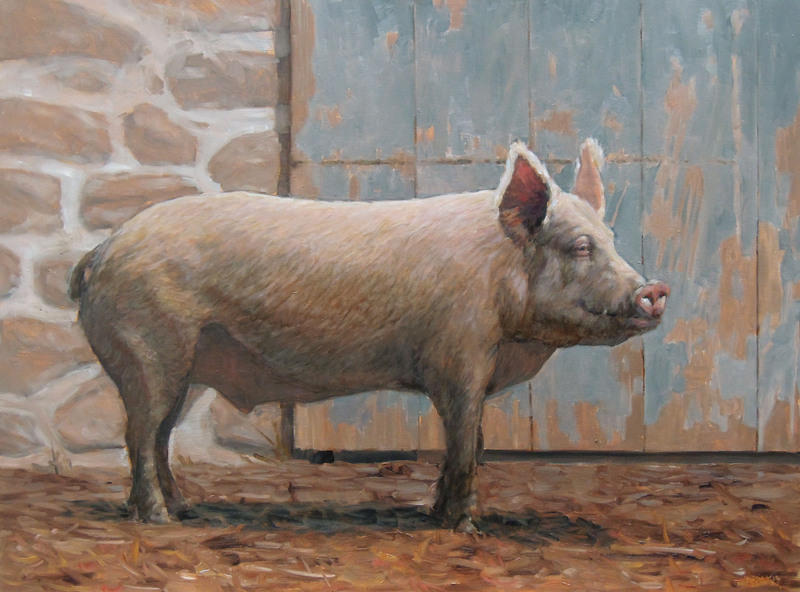 There's something about the stillness of the pig standing there. It's as if you are right there with him in that moment. "My paintings aren't just what I see," Beck says. "They're not static. They're who we are and there's always the before and after." Each of Beck's paintings zeros in on the here-and-now aspect of the larger scene. "Crows" would have been just a painting of the round hull of a boat waiting in a shipyard for repair, but then crows flew in and Beck painted them perched on the boat thereby creating that in-the-moment feel you will find throughout this entire exhibit. One of the runners in drag in New Hope's "High Heel Race," falls as the racers go on and pedestrians watch. Joanie, the bartender at The Swan in Lambertville is pouring a drink in "Martini." Two fishermen in a dory watch in wonder as a massive whale rises from a night sea blowing its breath in a tower of mist and spray. In "Scent of the Sea," a dog stands alone at night on a snowy shoreline watching waves splashing in on rocks. The orange glow of lights and smoke rising from the chimney of a house seen over the rise depicts a cold winter night, but it's that lone dog sniffing the sea air that locks in that moment of time. And then there's Beck's monumental painting, "Baptism" that he says began with his thinking of climate change. To describe the elements that make up the whole will not do it justice. This is one you have to see and when you do, you will understand. Let it suffice to say you will see a barefoot man standing in water holding his infant child as he is surrounded and dwarfed by wildlife animals emerging from darkness. Robert Beck has lived in Bucks County all his life. He was a business man until, at the age of 40, he decided to leave the business world to become a painter. He studied at the Pennsylvania Academy of Fine Arts. He has had exhibitions at the James A. Michener Museum, Trenton City Museum, and the Maine Maritime Museum and his work has been shown at the Museum of the Shenandoah Valley. He has had 33 solo shows, including a the National Arts Club in New York, and has received 29 major awards. For this exhibition, he invited Lambertville's Katherine Hackl to exhibit her exquisite ceramic works with him. On display throughout the exhibit are groupings of her hand-thrown stoneware and porcelain forms. Many are decorated with hand-carved botanical motifs done with a sgraffito technique in which the clay body is layered with a colored liquid clay into which her images are sketched and carved freehand then finished with a transparent glaze that is dishwasher ad microwave safe. Especially beautiful are her blue and white porcelain "Birds in Branches" vases. 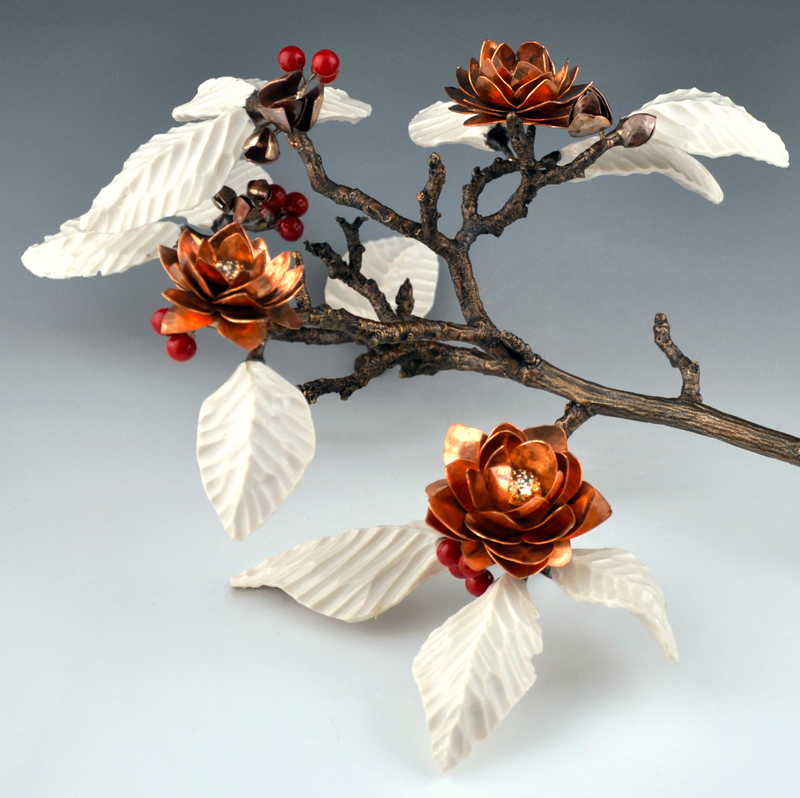 Her table-top sculpture, "Copper Fall Flowers" is a porcelain, bronze, epoxy, copper and coral work where the copper flowers rest on white porcelain leaves. "Black and White Flower Burst" incorporates porcelain, bronze, epoxy and stone where white flowers and black leaves are on a textured flat stone. And "Evening Branch, White Flowers" is a wall piece of porcelain, bronze and epoxy with three flowers blooming atop a tall graceful branch. This is an exhibit you should not miss. Hackl's functional yet fine art works quietly complement Beck's paintings that take us into contemplation of those archetypical moments in time that are often overlooked.